Troubled times bring out the best of people. This event is set in a National time of shock, disbelief, and that most terrible of feelings, the unknown. This may not be the best of leads into to this weekend of celebration, but all did happen. Traditionally this event is an acknowledgement of the State of California proclamation; the fourth Friday of September will be recognized as American Indian Day. This was signed into law by, then Governor Ronald Regan. Thusly, for many years it has been held on the Saturday following this date to accommodate those who were committed to Work and those that might need the extra time to get here from where they were living now to the event in Balboa Park. This location has been the first choice from the beginning for many historical lessons that needed the right time to be declared. The 1999 Jose M. Hatam Days committee, that selected this author to chair, was the beginning of a public awareness and education program. Other committees have 'yo yo-ed' the date and focus of the event but it continues to endure. History will teach us this is the TRIBAL AMERICAN MILLINIUM. The legacy of the California Tribal people is a lesson for all Americans to learn. Endure, Endure, follow your custom and tradition, learn your traditional ways, these are the things that we must hold on to. The Creator is kind to all his creation. Things are never more than what we can endure. This is the compassion of the Creator. Our individual character will define how we deal with the circumstances of life. That is the price of free will. No freedom comes cheap. All freedoms entail a commitment of spirit. The appropeatness of the California Indian Days event was under constant consideration hour by hour and day to day. Those who were there definatly endeavored to persevere. Not everybody is glued to CNN or wrapped up into the miniscule minute of reporters, even as they are scratching to report something out of the tragedy and confusion. The children were there, smiling, trusting, running in the sunlight and shade, wiggling their toes in the grass. The children were laughing and rolling in play. These children are our future, we must always think of them. 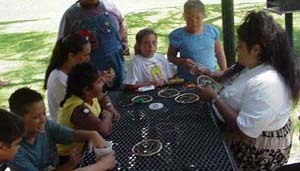 Title Nine Indian Education Program demonstrated leadership at the last organizing committee meeting and volunteered to offer a children's craft corner with comminuted volunteers and staff instruction- for free. No cost, all supplies all smiles, all joy, and all stories of accomplishment and pride in our Indian heritage, free. Organized by Vicky Gambala, the Children's corner with a sea of tables saw hundreds of children over the two days. Yes, this alone, makes it all worth while and very very necessary for our traditional ways to endure. There were many other points of brilliance in this day overcast with tragedy and confusion. So often interest is voiced by other cultures regarding the local tribal people music and art. This is the place to be this weekend. California Indian Days Celebration presented a jam-packed schedule of selected tribal dances regalia, songs and words of encouragement to those in attendance. This event offered an opportunity to examine complexities of form and style not often seen out of the traditional role of song presentation. Birdsong are one of the major styles sung in this Southern California region. These songs extend over tribal and linguistic boundaries. In point of fact these songs extend beyond the imposed international boundary. These Bird songs have been sung before time immemorial. Their role is multi-faceted and multi-dimensional in expression and application. At this event there were five or more variations of the traditional Bird songs. There was a lot more music on hand this weekend for all to enjoy. This event is always free and open to the public. Additionally, in attendance, were forty or more vendors. Current information, health screenings, beautiful tribal art, impressive items to display and of course food booths for everyone's favorite, FRY BREAD! Yes, indeed, those calorie and carbohydrate counters were redlined in delight and delicious mouthfuls. We must acknowledge the support of the Kummeyaay Bird singers, Ernie Siva, Running Grunion (Abel Silvas), Four Winds Music Ensemble and the ever popular, Native Blues with Tracy Nelson, Harold Hill and the remainder of their members. Additionally, Kupa singers from Pala with Leroy Miranda. Juan Meza led the Hemuk Auka bird singers from Baja. I've saved the next and very popular large group of singers and dancers from the Bay area, Rumsen Ohlone led by Chief Tony Cerda and members of the Costanoan Carmel Indian Tribe. These were crowd pleasers and very colorful in they're traditional regalia and body painting. Finally I must report the heart-felt gesture and traditional lesson taught to us all this weekend by Jane Dumas and Ester Abrahano. These ladies brought a beautiful bouquet of cut flowers and a candle, following local custom and tradition, we recognized the temporal nature of our life on this Earth and what we, the living can do to console when our loss is too much at the time. We thank you both.